This was done for my Sister's Ex-Husband's Girlfriend, Stacey. "whew" It is for her son John who graduated High School this year. Conveniently I live a block away from the Mainland High. 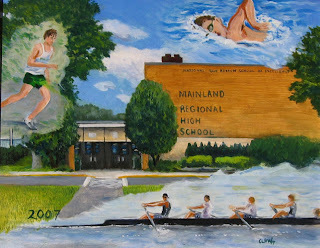 She wanted me to put images of John's sports endeavors into the painting...this is what I came up with.